Wedding anniversaries are a beautiful tradition that celebrate the love a couple shares for one another. Although the act of celebrating wedding anniversaries is classic, not everyone knows there is a list of traditional anniversary gifts to accompany each year. It can be extremely difficult to find that perfect gift but Memorable Gifts is here to help! We know some of these gifts might seem a little strange at first but despite a few head- scratching selections, the list features a range of helpful, thoughtful, and diverse gift ideas. Alongside the traditional gift guide, there is now a modern day guide as well! 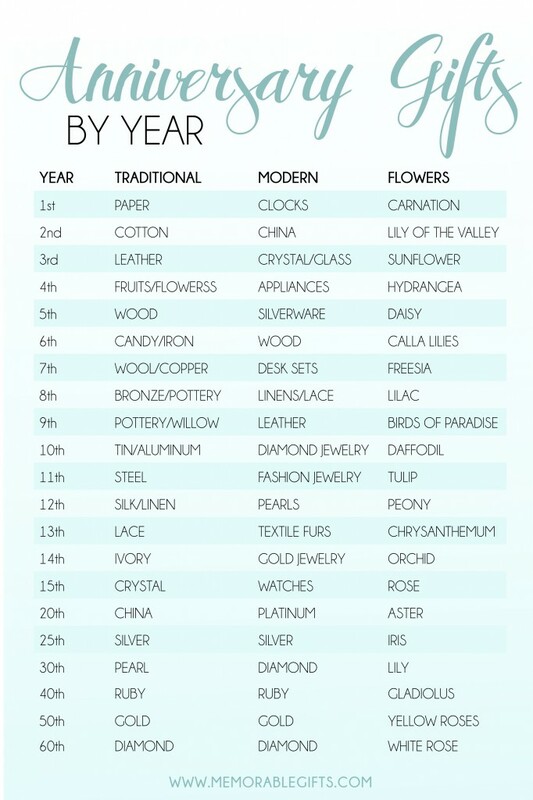 Regardless if you feel this gift list is dated and archaic or classic and hip you can choose to interpret the suggested material as loosely as you’d like. Don’t forget to incorporate flowers into your special day as well. Most people find the flower guide to be extremely helpful too. Both the modern and traditional guides continue to be referenced today by gift-givers, although it’s not required for a bride or groom to follow them. Whether you decide to use these gift guidelines or not, be sure to spend some quality time with your loved one. Sure, material objects are nice, but your love is the best gift you could give to your spouse! Memorable Gifts has a great selection of traditional and modern anniversary gifts for every anniversary. Traditional gifting ideas is really new to me. Anniversary is a beautiful day which makes bond more stronger day by day and remind us the beautiful memories that we had shared together. Flowers gifting tradition never gets old it have always been classic and decent in every century regardless of age or gender it always looks beautiful. These ideas were great! Browsing through your article here and there were tons and tons and tons more of information! There’s enough gifts/ideas here to last me 50 years with my spouse. I love the approach you took in this article. There were many things here I hadn’t thought of, and will actually be using on date nights to bring the romance back after having a baby. Your blog is something worth reading and Exciting with full of facts you shared here for anniversary gifts; we can co-relate due to same business we deal in. We appreciate the work shared on this blog. Great ideas. Nice to have that help when you are stuck. My husband gave me a sketch of my wedding dress and his suit for our one year, which is paper. I love the theme idea. Tradition gift ideas are new and exiting to make your spouse surprise. Thank you for sharing such information. Love all of these. Your presentation of gifts according to age is very helpful, Thanks for sharing such a amazing post.